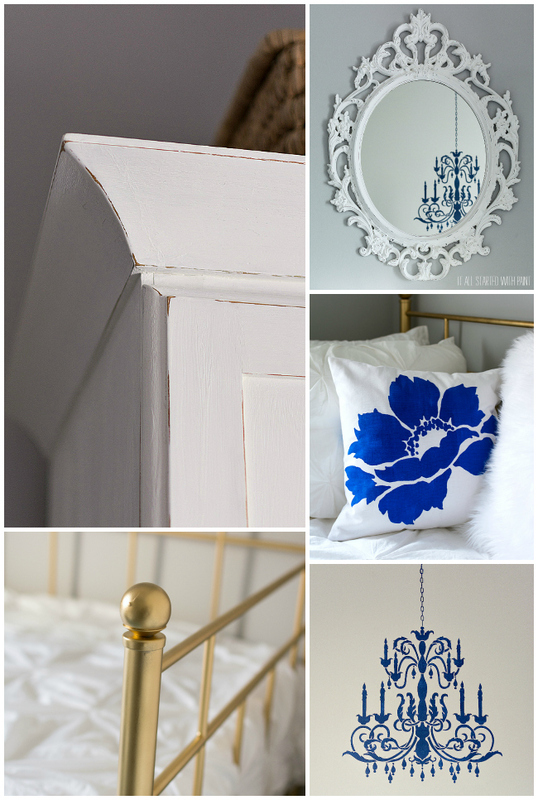 Gold Bed Frame … Spray Painted! Gold Bed Frame: How To Spray Paint A Bed Frame. If you’re ever in the middle of a project and run out of liquid nails, just use toothpaste. I don’t know how the toothpaste got everywhere. And I mean everywhere. The sink and faucet, I understand. But the shower curtain? Not so much. Are they brushing their teeth so vigorously that toothpaste is just flying off in every direction? Mike took care of the de-toothpaste-ifying of kid’s bathroom last time around. But I didn’t feel it was fair to subject him to that horror story again. So I rolled up my sleeves and dug in. because instructions were not included. And none could be found online. But before embarking on the puzzle that was assembling, there first was the spray painting. With Rust-Oleum’s Metallic Gold Spray paint. 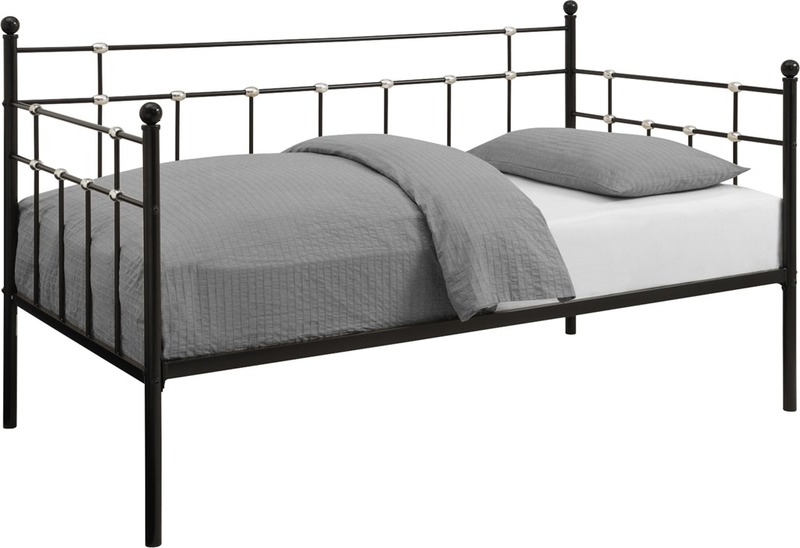 It’s the DHP Hayley Metal Daybed that I found on Wayfair. I debated between assembling the bed frame in the garage and spray painting it there, or just lying out the parts on cardboard and painting one side and then flipping to spray the other. In the end, I opted for the spraying of the parts. I gave them 24-48 hours before flipping over. And then another 48 hours dry time before assembling. Oh, and I ended up using four cans of spray paint to get the job done. I would like to thank Rust-Oleum for providing me with the metallic gold spray paint needed for this project. 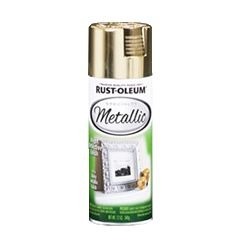 However, any and all opinions about gold spray paint and Rust-Oleum and the potential use of toothpaste as a liquid nails substitute are 100% my own. It looks great! When exactly was it warm enough to spray paint in your garage???? 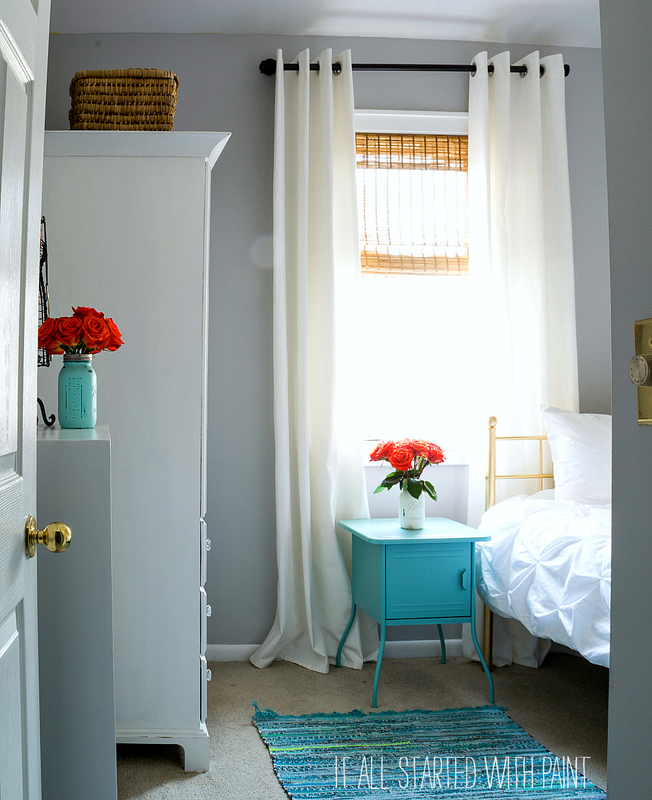 So very, very beautiful and glamorous!…Looks like a totally different bed….Great job and great idea Linda! Too funny! My 4 year old grandson lives with me…know what you mean about the toothpaste! The bed looks wonderful! I love the gold idea. I just spray painted a bed silver and now I saw this and wish I would have gone with gold. 🙂 It looks so custom! What a wonderful transformation. 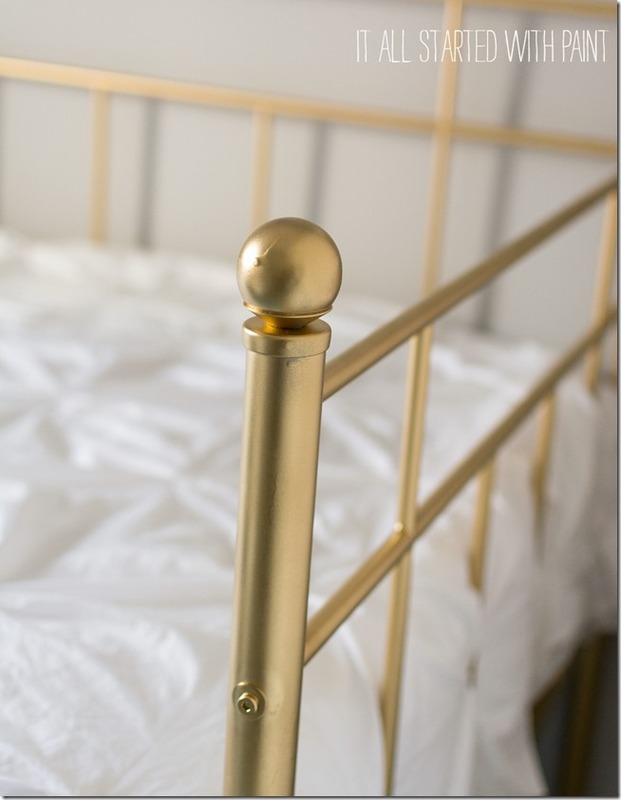 Ooooohhh, am loving that gold bed and I’m not a gold lover, prefer silver, but that is outstanding. Looks quite snazzy with stenciled chandy overhead. Is Molly quite pleased with her bed? Hope so. She’s going to feel quite grown up and special with that room. How old is Molly? Here we were thinking it was our fault, or more precisely, our router and/or computers that they’re slow. Had article in last Sunday’s paper that Grand Junction and surrounding areas do not have power needed by some companies in town to supply speed/power needed to run their businesses online. ah ha. In other words providers are saying they have such and such power and of course charge for it but aren’t able to provide speeds they charge for. I pay more than $61 a month and only have one other choice for provider out here. Have tried Century Link, had nothing but problems for over 6 yrs, til I finally got fed up and went to Hughes net, some other choice. No cable out here and cable provider in areas that have it has had all kinds of problems, people without their internet for days on end. I am really disgusted. Called Hughes net and they tried to blame it on my computer/router. No discount at all. They have us, what choice do we have besides no internet at all? Even KY wasn’t this bad. Ok rant is over, sorry Linda. Have a good week (minus toothpaste cement I hope) and enjoy any nicer weather that might sneak in. Molly is 14 and just adores her new bed and bedding. In fact, it’s even harder to get her out in the morning!!! And it was near impossible before! Yikes! I do need to get the kids invested in, at least, giving it a first clean so I can come in and give it a deeper one! Always love your lovely comments and hearing about your similar (and sometimes not) experiences and life! I raised 2 boys. I can tell you tooth past is nothing. I once went to put my son’s underwear and socks away in his nice NEW solid OAK dresser and when I opened the drawer there was a can of spaghetti o’s that he opened and changed his mind about eating. So he put them into his dresser drawer. When I found it there were green with HAIR growing on them. Another time I was making his bed. Out of the blue I was over taken and almost eaten alive by ants. I moved the bed to find loads and loads of cheese behind his headboard. He was keeping it there to snack and forgot it. Beautiful! 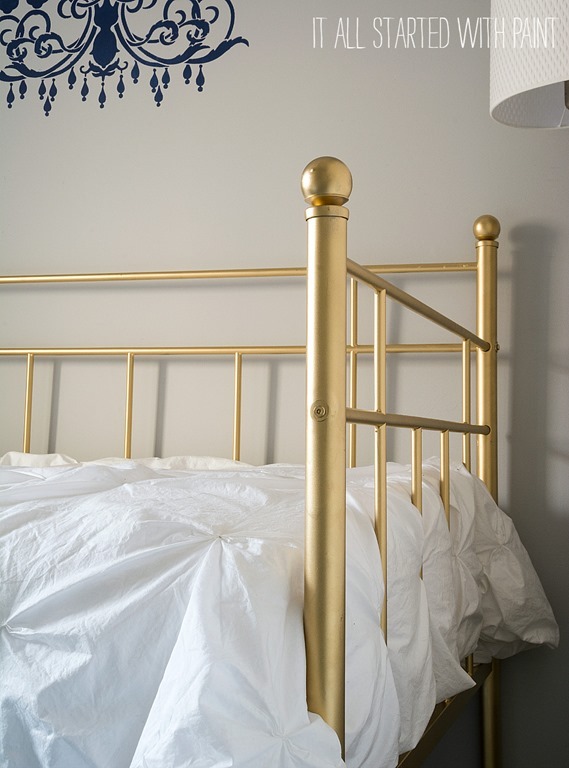 Those Rustoleum metallics are my fave, nobody would guess the bed didn’t come that way! So sorry about that! I’ve notice a bit of that wear and tear on our bed too. 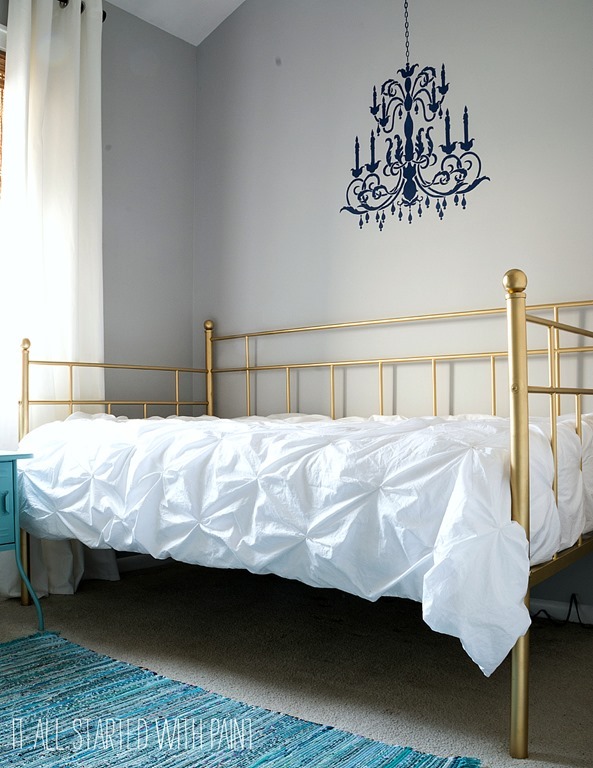 Though, I’ve decided it looks like patina and character and the bed frame has has morphed into an aged brass kind of look. That’s what I’m going with! Sigh. thank you for saying how many cans you use. and also that the metallic paint chips easily. I intend to paint my kids bunk beds white and the gold for the wooden stoppers. I will try to use your method.